I’m returning to my editing roots! This service is a little different than what you might expect. I’m beginning a First Five Pages content edit. Check out below to see what that means and my credentials. 3 passes that included inline notes. An edit letter with general and specific advice based on things like hook, voice, pacing, genre match, clarity, readability, etc. As well as a “what you’re doing really well” section, because those are the things we don’t want to lose. With this comes an optional phone call up to 30 mins to follow up on your work or any questions. It would happen no sooner than 3 days after you receive the letter because…mulling is good. This is NOT a copy edit. I’d expect your work to be clean enough that it’s readable, but not copy edited. I won’t be looking at copy edits, but if I notice something repeating, I’ll point it out to address before working with a Copy Editor. I may have a CE from Emerson, but Content is my first love. The introductory cost at the moment is $100 for the 5 pages, NY standard formatting (which, I believe is long enough for most people – once you’re used to feedback, running with it thru the enter MS gets easier) and call. BA with: Lit, Creative Writing, & Education attached. CE from Emerson’s Publishing Studies. Studied in undergrad under a top editor and worked as his Jr. Editor. Years of doing edits for fun and money because making stories stronger is a passion. If you’re interested, please email me at briaquinlan @ aol.com with your genre, one line blurb, and expected word count of full MS (even if that’s just short story/novella/full/long-full). I have turned someone down for the first time because her one-line blurb was too close to a story I’m personally working on. I’ll make sure my personal writing and editing do not overlap to protect both of our creative worlds. A post about if a First Five style edit might be for you HERE. Bria has everything you could want in a good critique: experience, a great eye for excellent writing, and just enough compassion not to rip your heart out as she does with your pages. By far one of the best critiques I’ve received! Y’all- I just got my 5 pages back from Bria and she does an AMAZING job!!! This is definitely a service I need and I am so glad she is thinking about offering this as an official paid service because otherwise I would have to keep bugging her to do it for me off the books. 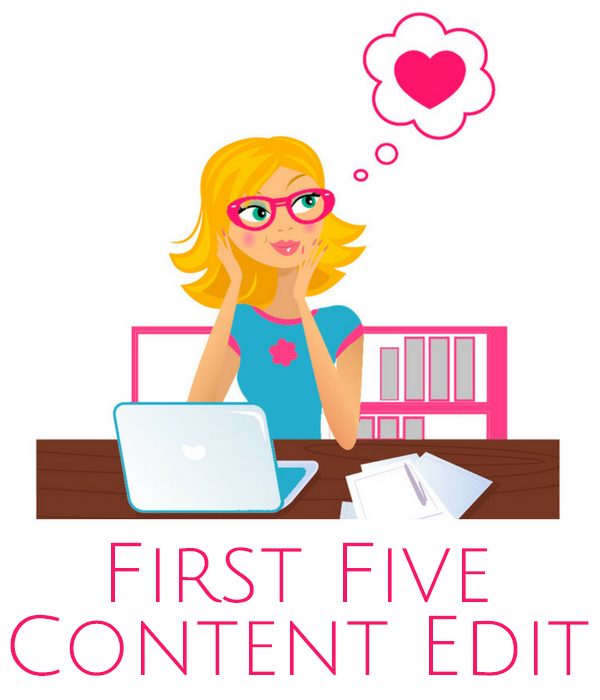 Now that I have had the First Five Pages Content edit I can’t go back. In fact just getting it ready to send it to her made me take a hard look at what I was submitting and how an outside reader would look at it. I admit- I was a little scared, nobody likes being criticized. But this review was perfect. All the feedback was very constructive; she had me laughing even as she was pointing out areas I need to work on. I agree with 100% of the things she suggested and it’s really making me think harder about my story. The feedback she gave me was spot on. Some stuff I already suspected and others were things I had been blind to before- total AH HA moments! I also really appreciated that she pointed out the things that were working along with things that didn’t work. AWESOME- I would totally hire her in a heartbeat ? ? ? Turnaround time: 8 days from scheduled start for First Five. 2 weeks for extended reads. Turnaround Time: Up to 80k = 2 weeks. We’ll talk for more than that. Turnaround Time: Up to 80k = 3 weeks. We’ll talk for more than that. I understand sometimes you’re in panic mode. Scheduling people when I have other things on the calendar or taking time out of scheduled writing and/or events is sometimes possible. Contact me for panic situations and I’ll send on a costs list. 50% of your invoice will be paid in advanced as a non-refundable deposit. The first time you miss your week (this means being more than 48 hours late) and wish to reschedule, 1/2 of your 50% deposit will be put toward the next scheduled week…and non-refundable. A second time would mean we should rethink our partnership.